Watch Morrissey Cover The Pretenders' "Back on the Chain Gang"
Morrissey has released a video for his cover of The Pretenders’ “Back on the Chain Gang,” off the singer’s forthcoming special-edition re-release of Low in High School, out Dec. 7 through BMG. The re-release will feature four unreleased original tracks, five live covers of Morrissey’s favorite artists, and a limited-edition lithographed photograph of Morrissey, according to a press release. The video comes ahead of Morrissey’s scheduled performance of his “Back on the Chain Gang” cover on The Late Late Show with James Corden on Nov. 7, and features the singer performing in front of a wall of posters, all of which feature his likeness, pulled from various points in the man’s career. It’s a tribute to The Pretenders, by way of a tribute to Morrissey himself. Watch Morrissey’s video for “Back on the Chain Gang” and hear The Pretenders perform the track live circa 1985 below. 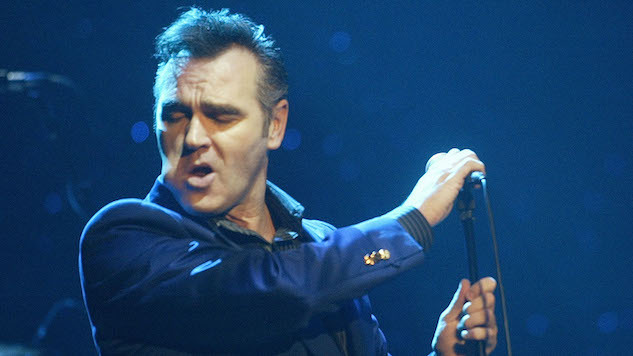 Morrissey will be touring for the remainder of the year—find those dates further down.